Never let it be said that I don’t like to try and please everybody. Well, you could say it, but for today at least, it isn’t true. My family would vehemently disagree with this statement: I am still experimenting on them with tempeh recipes when they would really rather I experiment with how to get the lightest pastries, or the most delicious sausage stew. But what are families for if not to bother them with food some find disagreeable in the hopes that you’ve made it agreeable? That’s certainly my schtick. Poor things. I am sure they long for a mother/wife who doesn’t feel an overwhelming desire to convert everyone to the joys of a plant-based diet, and one that includes tempeh at that. But they are stuck with me. And with tempeh. Looking at my WordPress stats I see that some of my most clicked on posts and links are to do with gluten free and low carbohydrate diets. I enjoy the challenge of making up (or tweaking) accessible and hopefully delicious recipes for these sometimes tricky ways of eating. And I will continue to go with the majority as I feel the personal benefit of eating like this most of the time, and think these types of recipes can have a place in many peoples’ daily diet. But, I know there are an awful lot of you who also appreciate the exact opposite of the aforementioned. ‘Proper’ bread, basically. And cakes. I don’t do an awful lot of either. 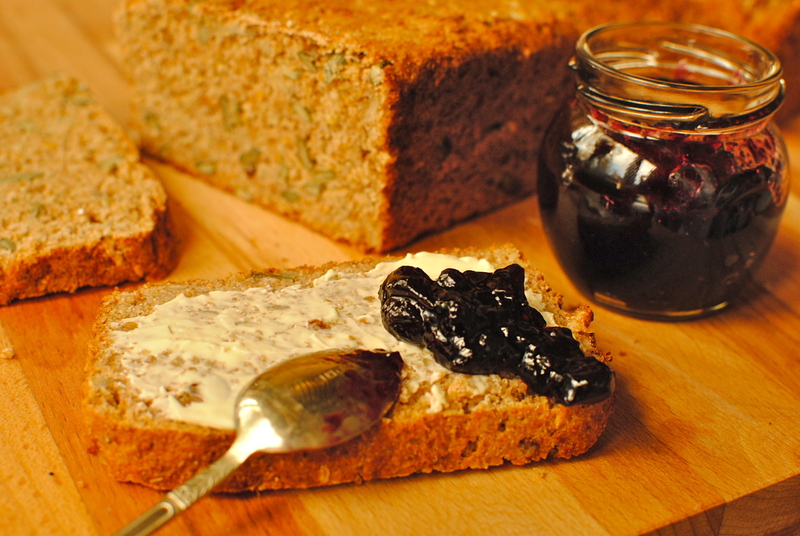 In fact I think I have only posted one bread recipe (two soda breads – foolproof) in the year and a wee bit that I have been pestering you all with recipes. So, today I am redressing the balance a bit with an extremely tasty no-knead bread. I hope you approve. It really is quite a delicious bread, and a lower GI/GL one at that. Which is a win-win situation when it comes to the most craved food on a low carb diet. Bread on a lower carb diet? Yup. All the seeds really satisfy and keep blood sugar level, which is good for anyone, regardless of health or weight status. So go on and treat yourself: Get out your best flour, grab those bags of seeds lurking in the pantry, and tie on your prettiest/handsomest pinny for a hands-on/hands-in baking session. Perhaps put on Miss R’s most excellent track of the week and have a wee boogie while you bake. 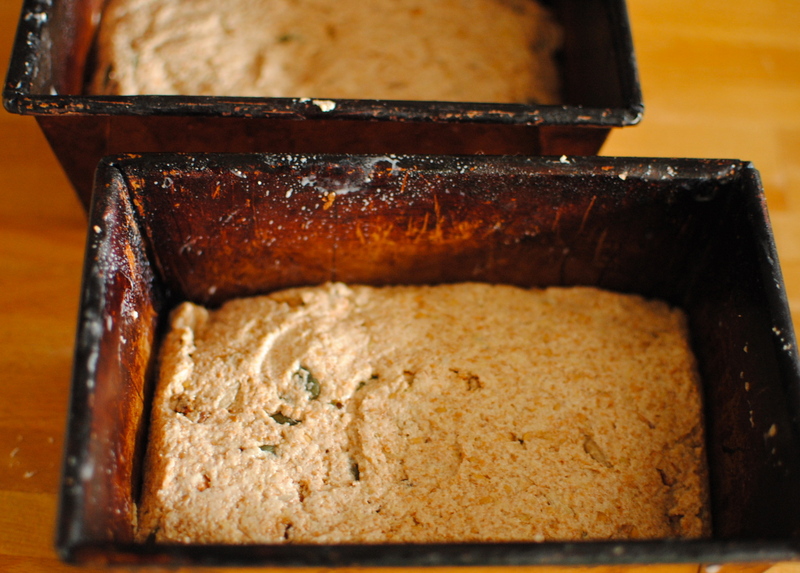 In no time you will have two gorgeous, healthy loaves of bread – one for immediate devouring and one for the freezer. Happy days. What food were you given as a child because it was good for you? Did you grow to like it, or does even the thought of it make you want to run a mile? I detested lima beans but got them anyway. If you like bread – and who doesn’t – and want something wholesome, easy and tasty, this is the recipe for you. 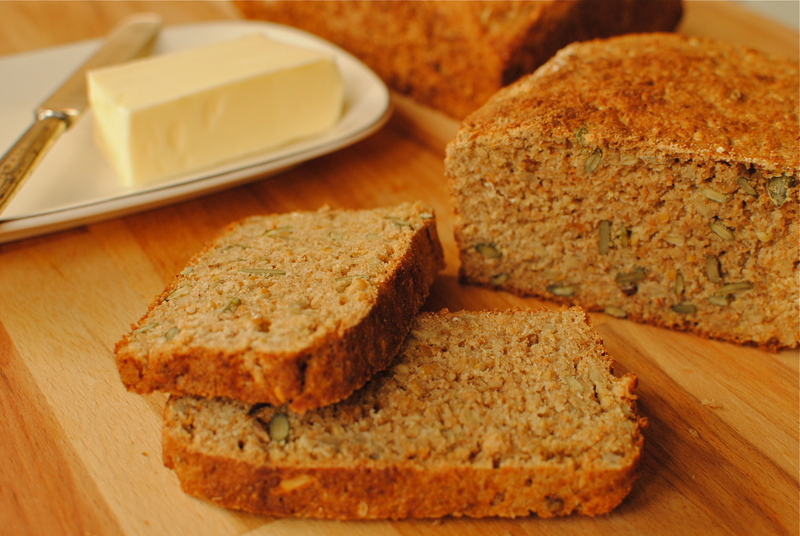 Based on South African seed bread, this loaf is chewy and very tasty. No kneading and one rise make this loaf a great choice for the novice bread maker or those who just want fresh bread quickly. As you can see from the list of seeds you get a whack of good fats and Vitamin E as well as fibre, but you will like it more for the taste. Oil and flour two 900 g (2 lb) bread tins, or one large baking sheet. Toast the seeds in a dry pan for 3-4 minutes and add to a large wide bowl, together the flour, yeast and salt. Use a hand to thoroughly mix the dry ingredients. In a separate jug stir the honey or malt extract into 550 ml of hand-hot water. Pour the water into the dry ingredients and lightly mix until you have a soft dough and somewhat sloppy dough (vigorous mixing toughens the bread). I find it easiest to achieve a light dough by making a claw of one hand and mixing, but use a large metal spoon if you like. Divide the alarmingly-loose dough between the two tins, or form into two rounds on a greased and floured baking sheet – cornmeal is good here. Cover the dough loosely with either cling film or a clean tea towel. If you are making rounds, dust the dough with flour and cover with a tea towel. 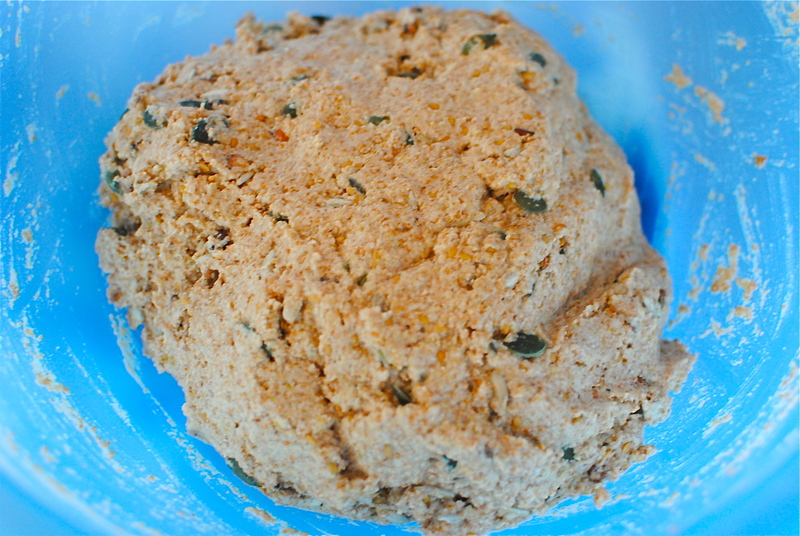 Leave the dough to rise in a warm, draught-free place until nearly doubled in size – about 40 minutes to one hour. It may not rise as high as unseeded bread. Meanwhile heat your oven to 200C. Bake the bread on the middle shelf for about 35 minutes. Remove from the tin (usually requires a firm whack on the work surface to loosen) and check that the bottom sounds hollow when tapped. If not, place back in the oven for a further five or so minutes – without the tin. Cool completely on a wire rack. Use one loaf and pop the other into your freezer for later. The breads keep well for three days and makes terrific toast. Really lovely bread. Highly recommended. A very appealing bread! All those nuts and seeds make for a delightful whole grain treat. Well this comment is for DJ Rachel who always manages to find brilliant tracks which have an uncanny way of going well with the recipe! She’s chuffed at your comment. I can see the Simon and Garfunkel link but I feel the Dylan one is stronger. As well as being his own man, of course. Such a catchy wee tune but not out for a few days yet to download. So cutting edge around here I almost cut myself. Lol :D. Maximo Park on verge of new release so can’t wait for that too. I love homemade bread, but usually the process puts me off. seeing a no-knead bread recipe cheers me up(: you’ve inspired me to go do something with my sourdough starter (: love the idea of adding 5 seeds too, so might add a bit of sesame seeds to mine (if I really do get down to soem home baking). I was just writing a post about how I used to hate spring onions and coriander as a kid, and they came so abundantly on top of dishes too (I’m asian) but now I love them. Glad I’ve inspired you 😀 I used to have a sourdough starter but managed to kill it! Felt SO guilty… still do. But this is my go-to bread & we all really love it. I can’t believe it’s taken me so long to write it up but glad I have. Funny about you and coriander. I never had it when younger but I totally adore it. Hubby says ‘meh’. Tough!! Thanks for stopping by. Ugh!! I can’t think of much worse than room temp milk. Mind you, Scottish room temp milk is cold so you’d be fine over here 😀 I’ m not a milk drinker as such but if offered a wodge of chocolate cake, milk would have to be its partner. Criminal not to. I’m going to have to make this now!! Lovely bread! So glad you like the look of it! Use any seeds you like – those are just what I had lots of. I do think a light toasting of the seeds really brings out their flavour so be sure to do it for extra yummy flavour. Please let me know how it is. Thanks, Emilia. Love your baking tins — they look like they’ve seen a lot of delicious action! Oh, the bread looks very tasty too — must try this! Thanks Conner. The tins are probably about 23 years old, but funnily enough I don’t think of them as vintage. Perhaps cos that would mean I am too! That bread looks delicious! I wonder if it will work with gluten free flour…? It looks like if I added in some xanthan gum it would be a bread that would actually work GF, with maybe just a slightly altered texture. I’ll have to give it a go! I still remember buying microwave pasta meals for our packed lunches when I was little, and my mom forcing us to get the kind with meat in it because it had protein! I doubt it was very nice meat though, so that memory makes my stomach turn a little 🙂 Peas were another (actual) health food – I like fresh peas now but frozen ones still don’t do much for me! I would love to know how the gf version goes. Please get back to me. Even with the spelt flour it doesn’t have a big rise, and has a flat top because of all the heavy seeds so they would probs look exactly the same. As for peas, I’m not keen on them as is but fine if they are in something like my pea & coriander do from a few weeks ago. As for ‘mystery meat’, we were forced to eat that at school but my Mother didn’t. Thank goodness. I’m sure some peoples’ issues with food stem from forcing them to eat things they hated. Lovely seedy bread Kellie! 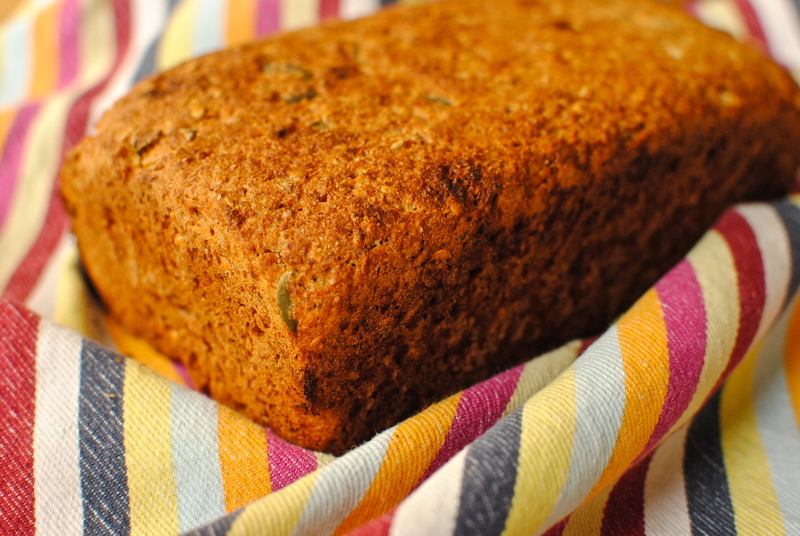 I haven’t experimented much with baking gluten-free bread, although it is always on my ever growing list to make. There were definitely things I didn’t like to eat as a kid, but to my parents credit, they never made me eat anything I didn’t like, and as a result, I eat pretty much anything these days! Loved Lima beans as a kid too :-). PS-love your cauliflower crust pizza! Tastes great but I need to find a way to make it come out of the pan 🙂 I think parchment paper might do the trick or I might try the cookie sheet next time. Hmm, I oil my pans and they come out absolutely fine. But then again, I have old pans. And I mean old. Glad you like the taste! on your side Kellie! I looooooooooove sourdough – and making the starter too. and all these seeds…… yummy! Buena suerte sweetie! Hope the weather is kinder, and that you stay fit and healthy throughout. Enjoy yourself, too! Well feeling proud and worthy here as I’ve actually made this and the loaves turned out very nicely indeed (oiled and floured tins – one whack and out they came). I have a real loathing for the white sliced variety – fortunately hubby has embraced sour dough culture and each weekend makes two fab loaves (and a lot of mess in the kitchen…). If you are passing by let us know and you can have some starter! Problem is that the sour dough loaves disappear in a day and I consider the sour dough to be real artisan stuff (in other words too much work for every day) so I was thrilled to get such tasty and wholesome bread from a very laid back no need to knead approach – very grateful indeed – just off now for a slice with butter and marmite – who could resist……. combine this kind offer with a visit to Pittenweem. Love to all of you clever Kennedys. Tried this recipe and it is just amazing. Love the taste as bread but as toast there is NOTHING to compare. Thank so much for the lovely feedback, Bill. You’ve reminded me that I need to make a loaf soon! It’s so easy, isn’t it? 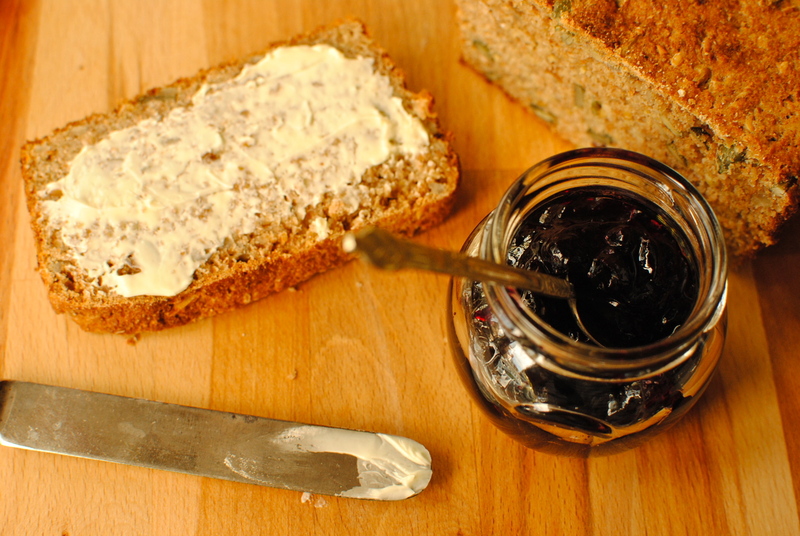 Hi Kellie – I made your/this bread today and am delighted with the result! Not being too sure if it would suit me, I made 1/2 the quantity to try. Can safely say, it’s a keeper! I did find more water was needed than specified, but adjusted to suit . Different altitudes always need to be taken into consideration. Interestingly, my hubby who doesn’t like seed bread, likes this. Oh happy days 🙂 Thank you! This is one of the most Delicious Bread i have ever eaten…Goodbye store brought bread for ever..